with our range of drink attachments. Create bold flavour combinations with the 1.6L ThermoResist™ Glass Blender. Achieve a smoother consistency with the accompanying stir stick. Serve fresh juices packed with goodness with the Citrus Juicer. Extract every last drop into the 0.6L bowl, leaving all the pith and pips behind. Blend-Xtract Sport Attachment is the simple way to enjoy delicious smoothies, juices and milkshakes, just the way you like them. Simply add your ingredients, twist, blitz and away you go. With this fast Juice Extractor attachment, breakfast is about to get a lot more exciting. The feed tube is able to take a whole apple, so any fruit is good to juice. 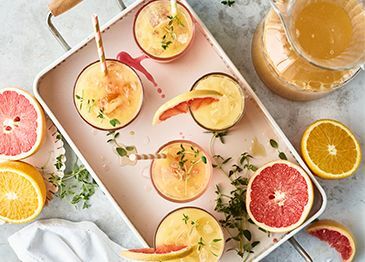 Create delicious purées and healthy juices full of flavour with the Fruit Press. It can even handle smaller and finer ingredients like berries, leaves and grasses. Made using the PureJuice Attachment. Made using the Citrus Juicer.